Rain, rain, go away…..NOT! We need the rain with the hot temperatures we are having this summer! Even when the weather is not cooperating to be able to take some nice outside shots of the plants…you can grab the camera and get a few pictures of the skies! The annual Perseid meteor shower is expected to put on a good show this week for those willing to get up in the wee hours of the morning and wait patiently for the shooting stars. In North America, the best time to watch will be between midnight to 5 a.m. on Wednesday, Aug. 12, but late Tuesday night and also Wednesday night could prove fruitful, weather permitting. Some of my favorite flowering shrubs of summer……. A few shrubs on my list are usually recommended for sunny sites, but all do quite well in shade, some even in full shade. 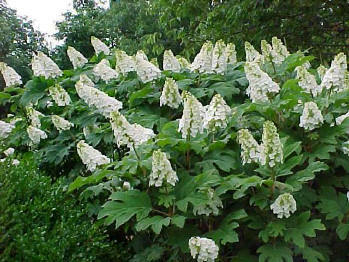 They are all sturdy, widely adaptable plants that resist both diseases and pests. If you have a shade garden, you may wish to add one or more to enhance the beauty of your summer setting.